Catherine Aust, who spent 2005 as a rookie in the Magic's color guard, sent in this one. 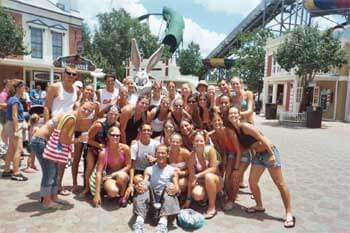 "This is a picture of the color guard, our staff member Rod, and, of course, Bugs Bunny at Six Flags Astroworld." Thanks Catherine! E-mail your best shots from the summer to dave@dci.org along with where and when the photo was taken. Send some biographical information about yourself as well. We'll give you full credit. Also, let us know if you want your e-mail address included.